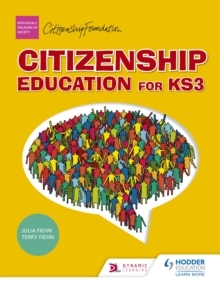 Teach the 2014 Citizenship curriculum with confidence using Citizenship Education for KS3, a single-book course that matches the revised Programme of Study and was awarded the Association for Citizenship Teaching Quality Mark in 2015. With a clear structure mapped against the Programme of Study and a range of accessible, developmental activities, you can ensure continual progression in your pupils' knowledge and skills across the key stage. The expert author team have designed the activities to be flexible, for use on their own or as part of your scheme of work. This book:- Allows you to teach new topics covered in the revised Programme of Study with confidence- Promotes knowledge and understanding of the content through active learning- Provides activities that are accessible to all abilities and are easy to prepare and use- Works perfectly in combination with Dynamic Learning Teaching and Learning Resources to offer you a complete package of print and digital supportKey Citizenship topics covered include the functions and uses of money and how the political system of the UK has evolved.